Starting a company is the most exciting, inspiring, daunting, challenging, frustrating, creative and rewarding thing you will ever do. You have the chance to direct your own career, and this is very empowering. Many new Entrepreneurs, however, are forced to learn hard lessons without any guidance - lessons that can make or break a company. K.C. Hildreth is an Entrepreneur and start-up coach who has compiled, from direct experience, 20 of the most important lessons any new Entrepreneur should know before embarking on the start-up journey. 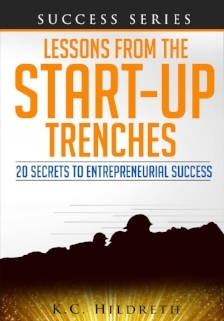 If you are starting a company, read this book first! You will not only increase your chances of success, but also save yourself a great deal of time, money and pain.